The Wolverines will be eligible for the playoffs this season, but they'll have to vacate the state titles won in the 2012 and 2013 seasons. The Washington Interscholastic Activities Association on Monday voted to lift the postseason ban on the Bellevue High School football team. The vote, which took place at an Executive Board meeting in Renton, makes the Wolverines eligible for the playoffs this season. The WIAA also announced that Bellevue will vacate its playoff results from the 2012, 2013 and 2014 seasons, citing a lack of “institutional control.” The 2012 and 2013 teams won state titles, beating Eastside Catholic. The 2014 team finished second to Eastside Catholic. The 2012 and 2013 titles will remain vacated, meaning no school can call itself the Class 3A state football champion for those years. The postseason ban was part of the sanctions placed on the program after multiple investigations found violations of WIAA rules regarding recruiting and out-of-season coaching. Those investigations came in the wake of a series of articles in The Seattle Times detailing the violations. Colbrese said the Executive Board voted to end the ban to avoid punishing players that did not benefit from the violations. “One of the tenets of the association’s penalty structure is to punish student participation as a last resort,” said Colbrese, noting that most of this season’s players weren’t yet in high school when the violations occurred. With violations such as these, the WIAA seeks to punish the institution and the students who benefited from them, hence the stripping of the titles. Calls and messages to Bellevue School District officials seeking comment were not immediately returned. Bellevue is 3-1 through its non-league slate (playing four games against ranked foes) and was ranked No. 9 in The Seattle Times state football rankings last week. The Wolverines beat Class 2A No. 1 Archbishop Murphy 35-21 on Friday. The Wolverines originally were banned for four seasons, which was reduced to two seasons in August 2016. Playing a reduced schedule in 2016, Bellevue went 5-1, was undefeated in Kingco 3A play and sat out the playoffs in 2016 to serve the first year of the ban. The team also was banned from receiving help from its booster club for four years. The school is able to appeal that decision and have that ban end in 2018. The WIAA also fined the school $2,500, which will be applied to WIAA coaches’ education and concussion-management programs. Bellevue appealed to the WIAA to get the postseason ban reduced in March, but it was denied because, Colbrese said, the Kingco Conference and the Bellevue School District, which imposed the original penalties, had not weighed in on the matter. 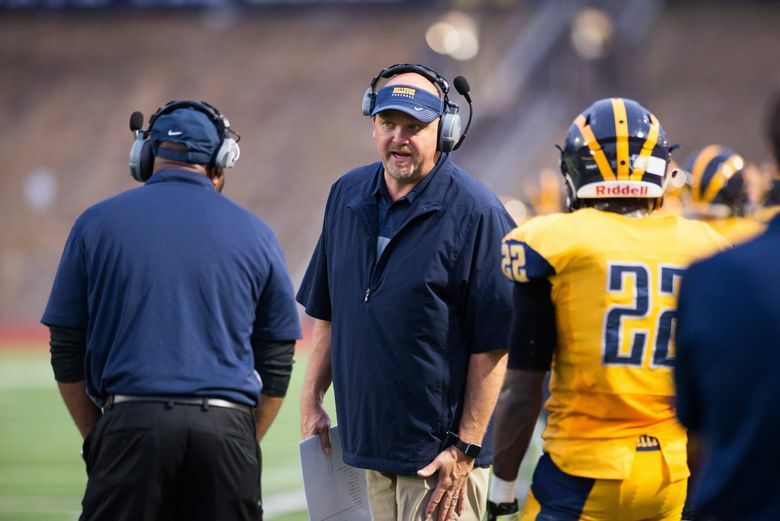 In the aftermath of the investigation, longtime Bellevue coach Butch Goncharoff was removed from his job, as was longtime assistant coach Pat Jones. Goncharoff was hired to coach football at Cedar Park Christian High, a Class 1A school in Bothell, in January. Jones has a defamation case set to go to trial in April. Goncharoff led the Wolverines to 11 state titles and two runner-up finishes between 2001 and 2015. He had 193-14 record in 16 years. Mark Landes, who was the special-teams coach under Goncharoff, coached Bellevue on an interim basis last season. The interim tag was removed following the season. This is the second time in recent memory that the WIAA has stripped a team of its state titles. The WIAA took two girls basketball championships away from Chief Sealth in 2006 in the wake of recruiting violations. That team also was forced to forfeit all its games for a four-year period. Colbrese said that since he started at the WIAA in 1993, these were the only two programs that had been stripped of state titles.